Who said trade shows are work trips? Miami Beach knows how to turn any occasion into a party, while keeping things lucrative. Located centrally in Miami Beach, the convention center is perched above the City Center and a stone throw from the legendary South Beach nightlife. Spend your days making a lasting impression with our trade show displays, and enjoy your evenings under the palm trees and ocean breeze closing deals! When you bring your company's wares or information about your company's services to a trade show, you gain a lot of visibility. Your presence there enhances your credibility among consumers and competitors. Presenting at a trade show also gives you an ideal platform for connecting with prospective customers. Your presence alone is a clear demonstration of your brand's reliability and commitment to the future. Where is the Miami Convention Center Located? The Miami Beach Convention Center is located at Miami Beach Convention Center, 1900 Washington Ave, Miami Beach, FL 33139. It is located centrally in South Beach, and has hosted such notable speakers in the past as Dr. Martin Luther King Jr. Think about what you want your display and presence at the trade show to provide to the guests who visit your booth. Do you want to meet people, engage in direct sales or add to your list of contacts? Which products or services do you want to promote? The products or services that you promote at one show might differ from what you promote at the next show. Be sure to choose displays that allow you to customize your booth's information as needed. You may also want to change things up based on the response that you get from the people who stop at your booth. Having the best display in the world will not help if people don't know about it. Before you even set foot into the facility hosting the trade show, start a campaign to promote your presence there. Email newsletters, social media and blog posts will help to build a hype campaign and inspire your followers, current and potential customers to attend the show and pay a visit to your booth. Building anticipation about your presence at the trade show could also increase your booth's foot traffic and sales conversions. At a trade show, you need to sell the story of your brand. Communicate what the benefits and unique features of your company are and why a person would want to choose you over your competitors. 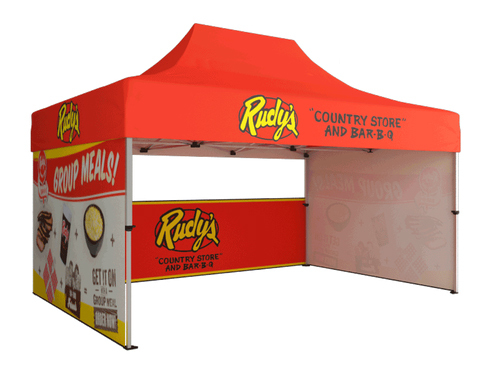 Your booth should clearly demonstrate what sets you apart and why your business is the best choice for meeting the needs of consumers. Visitors should walk away knowing exactly what your business is about.